We took BJ up on her offer to drive us back to the trailhead from Franklin. It was so nice to not have to hitch out of town, and we were able to start hiking by 930am. BJ even sent us off with some cookies she baked for hikers, which were a great snack on the trail that day. Thanks again, BJ, we appreciate your kindness! The morning started with a good climb out of the gap, eventually topping out at Wayah Bald after ten miles. It rained a bit on the way up, but not too heavy. We took a break, and officially met Molgli and Nick. The four of us were hiking within sight of each other for most of the morning. We’ve been seeing Molgli on the trail the past week or so, and turns out he hiked the PCT last year, too! He started a month before us, so we never ran into him then, but it was fun to compare stories. 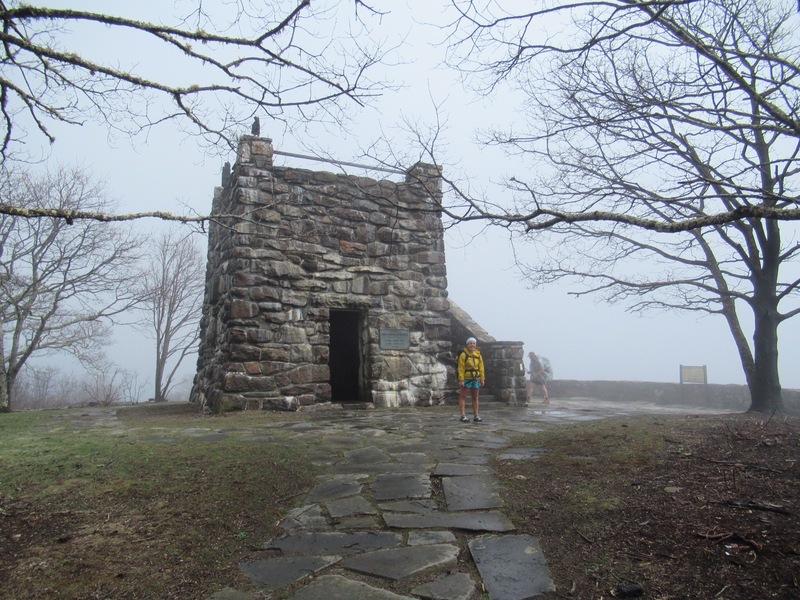 There is a stone tower atop Wayah Bald, which used to have a wooden roof. There were forest fires in this area last year however, and the roof and displays burned off the tower. It gave the bald a spooky effect to say the least. We headed down, and tried not to slip on the muddy trail from all the recent rains. Eventhough we hiked downhill most of the afternoon, it seemed to go slower than usual. We started going up again later in the day, and made it to a surprisingly empty Cold Spring Shelter- only Nick was there. We sat at the picnic bench and ate some snacks, talking some more. It was tempting to stay, but it wasn’t 5pm yet and we felt like we could go a bit further to a campsite in 2.1 miles. I felt much better after a break and a snack, and we cruised up the last of the climb to Copper Ridge Bald. 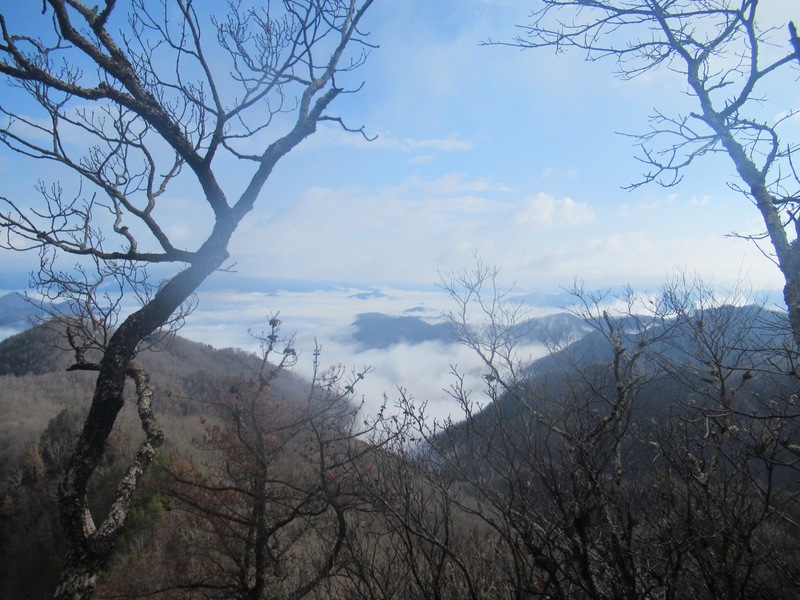 Unfortunately, the campsite on the other side was full, so we kept going into Tellico Gap. We were hesitant to camp there because there is a dirt road that passes through, and that sometimes brings unwanted cars. Our decision was made for us though as all the camping was taken there, too! 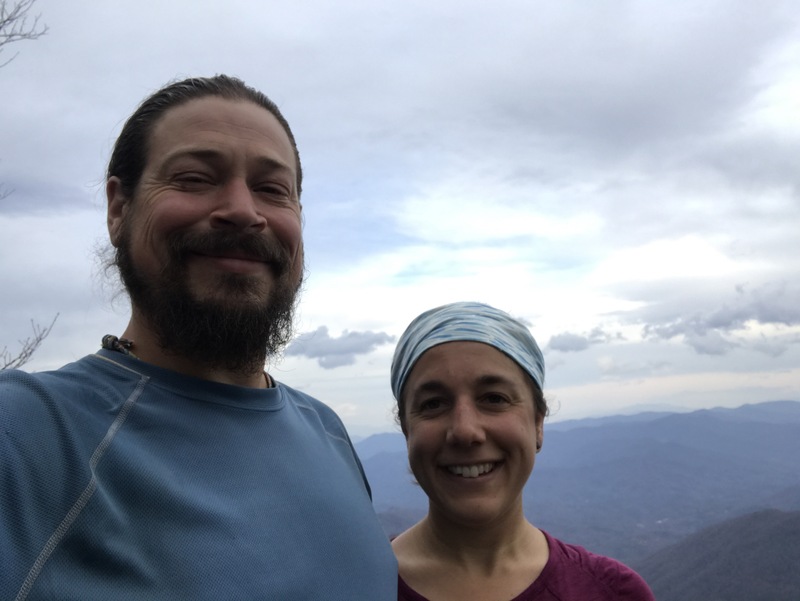 We were forced to keep hiking another 1.4 miles to the top of Wesser Bald where we thankfully found a camp spot over four miles and nearly two hours later than we thought we would! It was getting dark, but we had just enough time to eat dinner and get into the tent before nightfall. It sprinkled a bit as we were eating, but soon after getting into the tent thunderstorms passed through for a few hours. Sometimes I find it hard to sleep when there is lightening, but I was tired enough that the rain lulled me to sleep. 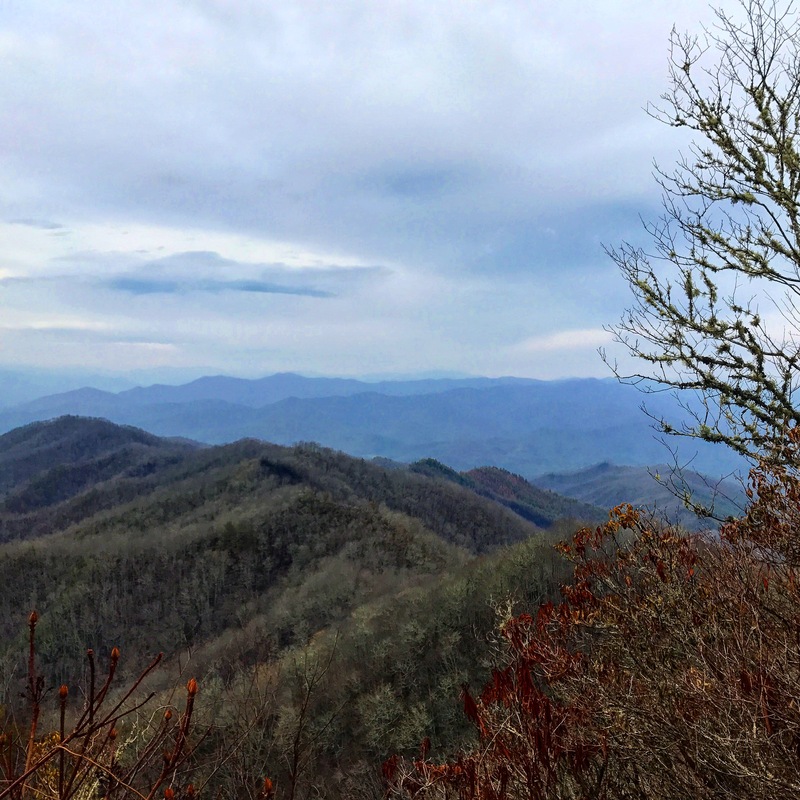 The next morning we were excited to make our way to the Nantahala Outdoor Center (NOC), but first we had to hike 6.7 miles downhill to get there. The trail was steep and rocky for the first few miles, but provided great views. We made it to NOC, which the trail passes by, in time for an early lunch. 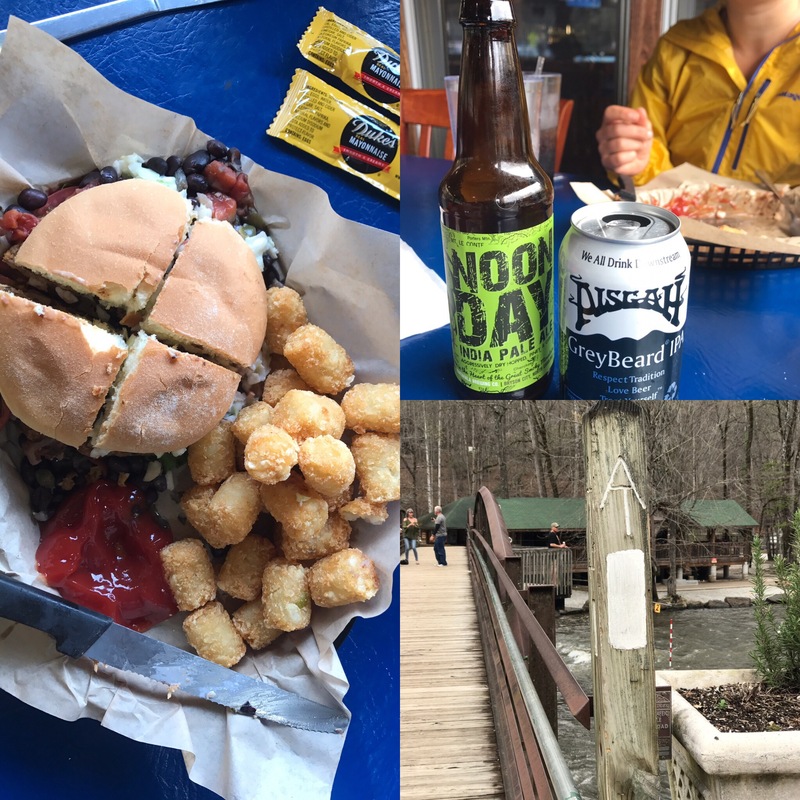 Hiked-hunger has started to set in, and we had no problem finishing our burgers (real burger and fries for G, veggie burger with tater tots for me). Garrett also sampled some of North Carolina’s IPAs. After the long down into NOC, we had a predictably long climb back out. The sun came out for the first time in a few days, and the trail started to dry out from the rain we’ve been having. We went up and over a couple balds, and made camp a bit earlier than we have been in Locust Cove Gap. There were 4 tents set-up already, and we scored the last real spot. After last night’s search for a place to camp, we weren’t taking any chances trying to go further; plus, we were ready for a slower night instead of rushing to make dinner and get in the tent before it rains or gets dark. Tomorrow we hope to make it 17 miles into Fontana Village to resupply for Great Smoky National Park, which I am really looking forward to!